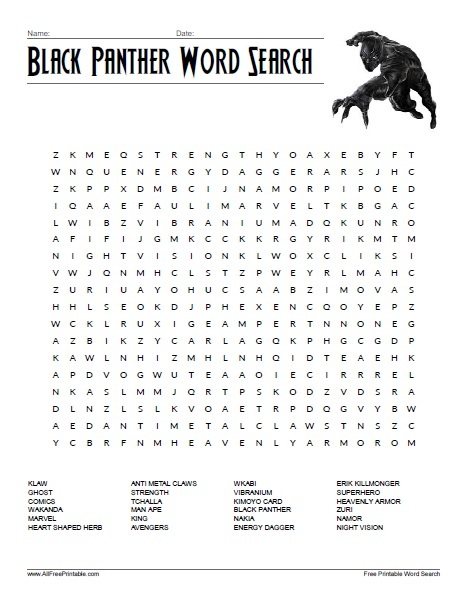 Free Printable Black Panther Word Search. Free Printable Word Search from the Marvel movie “Black Panther”. Have fun solving this word search and waiting for the next Marvel Universe movie coming soon. Share it with all your, friends, co-workers, students and fans. Print it free and search all your favorite characters from Black Panther movie. Find names and characters from Black Panther like Klaw, Wakanda, Erik Killmonger, Avengers, Nakia, Zuri, King, Man-Ape, T’Challa, Vibranium, Hevenly Armor and many more. The word search includes 24 words from the movie and the answers on page 2. Black Panther Word Search Puzzle is ready to print in PDF format.